GIFT CARD DRAWING ENTRY COMING SOON! The Edwardsville/Glen Carbon Chamber of Commerce will launch its annual shop local program on November 24, 2018 - Small Business Saturday - referred to as our Shop Chamber campaign. This campaign includes a contest designed to encourage support of Ed/Glen Chamber members, and drive consumers to local businesses with the opportunity to win gift cards. “This initiative has stirred up a great deal of excitement in the business community. Businesses are open to the concept and eager for the campaign each year,” said Desiree Bennyhoff, president/CEO of the Edwardsville/Glen Carbon Chamber of Commerce. "The Ed/Glen Chamber is committed to encouraging local residents to think of chamber businesses first for goods and services, and to support our municipalities by keeping sales tax local. 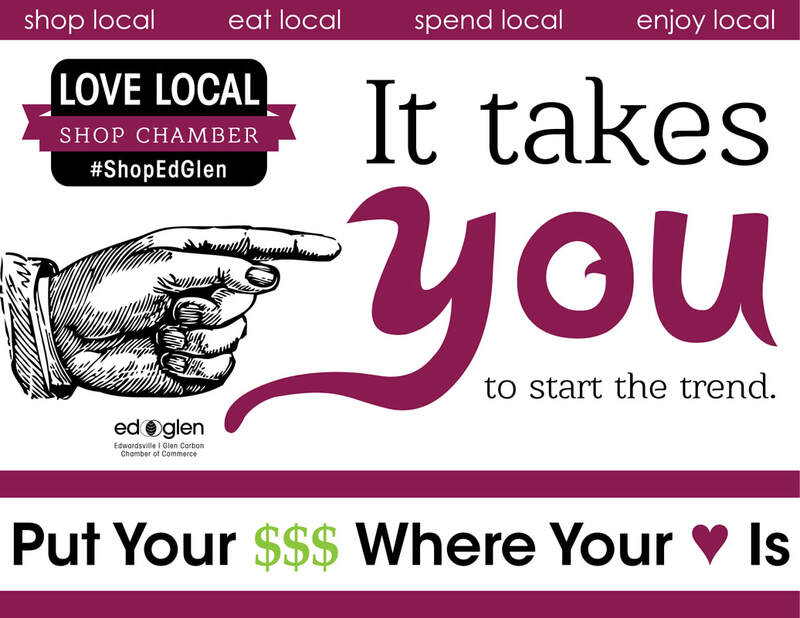 We want to give people one more reason to shop Ed/Glen Chamber businesses." According to a Schapiro Group (2012) study, when consumers know that a business is a chamber of commerce member, they are 44% more likely to think favorably of it and 63% more likely to purchase goods or services from the company in the future. Coupons for all participating 2018 Shop Chamber businesses appear below. All offers expire January 31, 2019 unless otherwise stated. Love LOCAL - Shop CHAMBER!